In USA Bengal's Date Palm Jaggery is not avaible. But few days back one of our family friend brought some of the Bengal's Date Palm Jaggery for me, as he knows I love to cook the traditional Bengali Sweets. So he brought me some Bengal's Date Palm Jaggery. And today I made "Nolen Gurer Payesh" with the Jaggery, and belive me my kitchen is filled with the sweet flavor of the Nolen Gur. And after long time we tasted our tradional "Nolen Gurer Payesh" Payesh is nothing but Indian style Rice Pudding, made by boiling milk, basmati or any aromatic rice and sugar or jaggery. This Payesh is the Bengali term of Indian Kheer. In Southern India it is called Payesam. 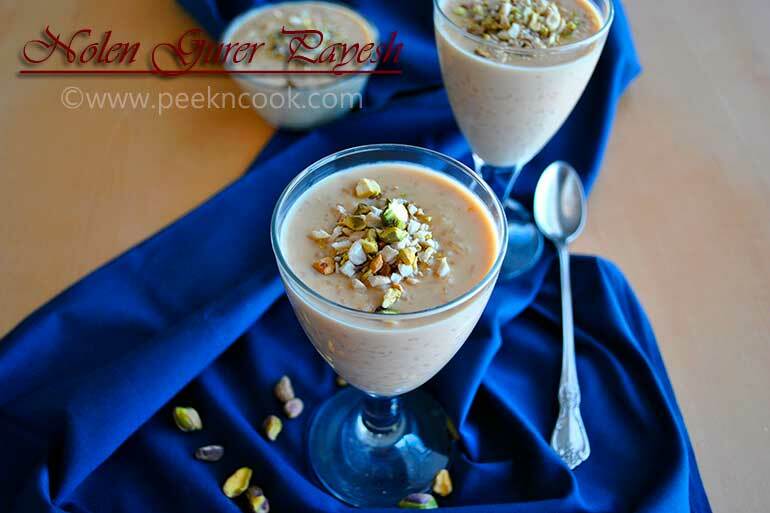 Here is a traditional recipe of Payesh, which is made with Jaggery instade of Sugar. Date Palm Jaggery has a nice smokey flavore and its caramel color makes the Payesh even more beautiful and tasty. Payesh is nothing but Indian style Rice Pudding, made by boiling milk, basmati or any aromatic rice and sugar or jaggery. Basmati Or Gobindo Bhog Rice 1 handful, soaked into cold water for 30 minutes. Whole Or Full Fat Milk 1 ltr. Date Palm Jaggery 1/2 cup, adjust to your taste, if you like you may add more of it. Take a large sauce-pan and add 4 tablespoons of water in it. Now add the milk and put on medium heat. When the milk will start boiling, stir constantly to prevent burning the milk. When the milk will be 1/2 of its original quantity, add the rice, but not with the water, in which the rice was soaked. Let the rice to cook enough. In the meantime take 2 tablespoons of the boiling milk in a small bowl, and add little Jaggery in the milk and mix it. If the milk is not curdelled, the jaggery is good. If it has curdeled, the Jaggery is not at all good, you have to add sugar instead of the jaggaery. Just add 1/2 cup of sugar and adjust to your taste. When the rice will be completely cooked, add the Jaggery/ Sugar and cook for another 10 minutes, stirring constantly. Turn off the heat after 10 minutes. Let the "Payesh" cool down completely, and keep inside the refridegerator for 2-3 hours. Remove the "Nolen Gurer Payesh" just before serving. Garnish with chopped nuts before serving.